Not only does Kathy Shore Nursery offer the classic Fraser Fir Christmas Tree, we also offer the beautiful White Pine Christmas Tree. The White Pine Christmas Tree will add an elegant touch to any room and its long, feathery needles are soft to the touch and pleasing to the eye. Our White Pine Christmas Trees here at Kathy Shore Nursery are carefully grown from seedlings to full size and are a great choice if you'd like to add a unique touch to your home or office! The White Pine Tree adds a touch of understated class and is a great alternative to the Fraser Fir Christmas Tree if you're looking for something that is just a tad different. White Pine Christmas Tree boughs are also used for our Wholesale Christmas Wreaths and Luxury Christmas Garlands. We offer Christmas Garlands and Wreaths using White Pine Tree boughs. We also use them in our Mixed Wreaths and Mixed Garland to create truly special greenery pieces. For additional information on our White Pine Christmas Trees, garlands, and wreaths, call Kathy Shore Nursery today. We offer various shipping options and will even palletize your order, saving your business time and money! 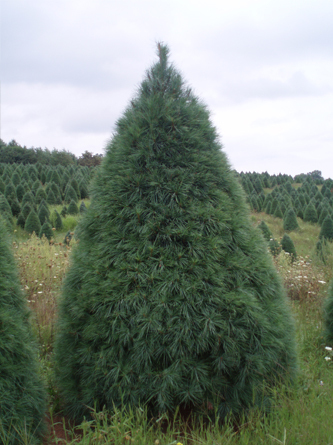 Kathy Shore Nursery strives to deliver only the finest North Carolina Christmas Trees and NC Christmas Tree Products!